To enquire about the Lola please use our contact us page. 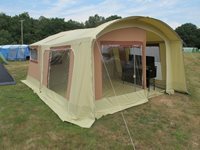 The Lola is an inflatable 2 berth trailer tent that takes less that 5 minutes to erect, making it perfect for touring and short stays. It comes with a 12v compressor and rechargeable battery so you have all you need for quick and simple camping. The inflatable cabin and living area is made from one continuous tube with one valve, the sun canopy that comes with the Lola is supplied with bamboo poles and tent pegs. The king size bed is accessed via a ladder and there is a large storage area in the trailer body that can still be accessed when the trailer tent is set up. 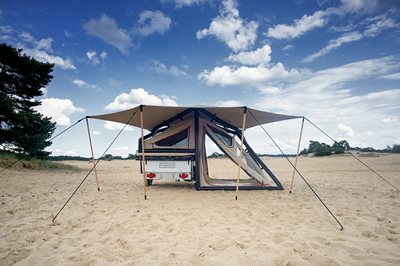 As with all Campooz models the Lola benefits from the Clima-C System for improved ventilation and to maintain a comfortable living temperature day and night. The canvas can also be completely removed and stored separately so you can use the trailer for other purposes all year round.